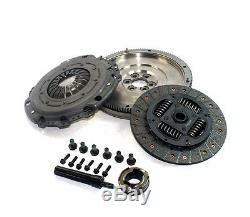 CLUTCH FLYWHEEL CONVERSION KIT fits FOR AUDI TT VOLKSWAGEN GOLF JETTA 1.8L 1.9L. All our brands specialize in manufacturing sport compact assemblies from street driven to full race applications. They do not require modifications in order to fit on your vehicle. These clutches are designed for the individual whose goal is to have a streetable clutch while still maintaining the high performance capabilities of a performance clutch. These clutches are designed to be used mainly on the street with occasional track usage. All of our Racing clutches require a 500 mile break in period. All our Racing Clutches consist only of the very best materials (MIBA). Increased clamp loads provide the capacity necessary to support the increase in torque that comes from modified engines. All of our discs have high capacity sprung center dampers to reduce shock on the drivetrain. The Steel Back Full Face Organic disc is resistant to slippage and burst. Brand new Bahnhof Heavy-Duty Pressure Plate Stage 1. Brand new Bahnhof HD Full Organic Woven Clutch Disc Stage 1. Brand new Solid Mass Flywheel. This Superior Quality Conversion Kit replaces the Original Dual Mass Flywheel present in some vehicles, which is notable for failing quite constantly and for having to be completely replaced every time you perform a clutch change. 2000 - 2006 Audi TT &###xA0;1.8L Turbo; Non-Quattro; (FWD 5 spd only). 1999 - 2004 VW Beetle &###xA0;1.8L Turbo, except Turbo S; (5 spd only). 1998 - 2005 VW Beetle TDI &###xA0;1.9L Turbo Diesel. 2000 - 2006 VW Golf &###xA0;1.8L Turbo, all including GTI, (5 spd only). 1999 - 2006 VW Golf TDI &###xA0;1.9L Turbo diesel. 2000 - 2005 VW Jetta &###xA0;1.8L Turbo, (5 spd only). 1999 - 2005 VW Jetta TDI &###xA0;1.9L Turbo diesel. Autoparts-Express is your #1 choice for replacement components. We offer brand new, quality auto parts with excellent wholesale prices. Our service and response time is second to none. We pride ourselves in being at the top of automotive industry. We have years of experience with all the Original Equipment Manufacturers (OEM), and we know what parts you need to get the job done right!!! After being in the industry for years, we have encountered just about every problem that exists when it comes to automotive parts. We offer you up to date technical bulletins which make your installation easier; and we guarantee every part we sell. Auto Parts Express is committed to providing the highest quality parts at the lowest prices. If you have any questions, comments, or concerns regarding any of our parts, we would be more than happy to hear from you. Write back to us with your questions and we will get back to you in the blink of an eye. Super Speedy Service We strive to provide you with super-speedy service. Must be in brand new, resalable condition. Items that have been installed, used or altered are non-returnable. This listing is currently undergoing maintenance, we apologise for any inconvenience caused. The item "CLUTCH FLYWHEEL CONVERSION KIT fits FOR AUDI TT VOLKSWAGEN GOLF JETTA 1.8L 1.9L" is in sale since Wednesday, June 13, 2012. This item is in the category "eBay Motors\Parts & Accessories\Car & Truck Parts\Transmission & Drivetrain\Clutches & Parts". The seller is "autoparts-express" and is located in Miami, Florida. This item can be shipped worldwide.